Secondhand seat belts can be a gamble, unless you’re sure the car they came from has never been in an accident. Not only can the mechanism be strained or damaged, but the webbing is designed with some energy-absorbing ‘give’ which will not be present if it’s been stretched once. New belts are relatively inexpensive and available to suit most mounting permutations. Kit car component suppliers are good sources of belts – try Car Builder Solutions (01580 891309, www.cbsonline.co.uk). 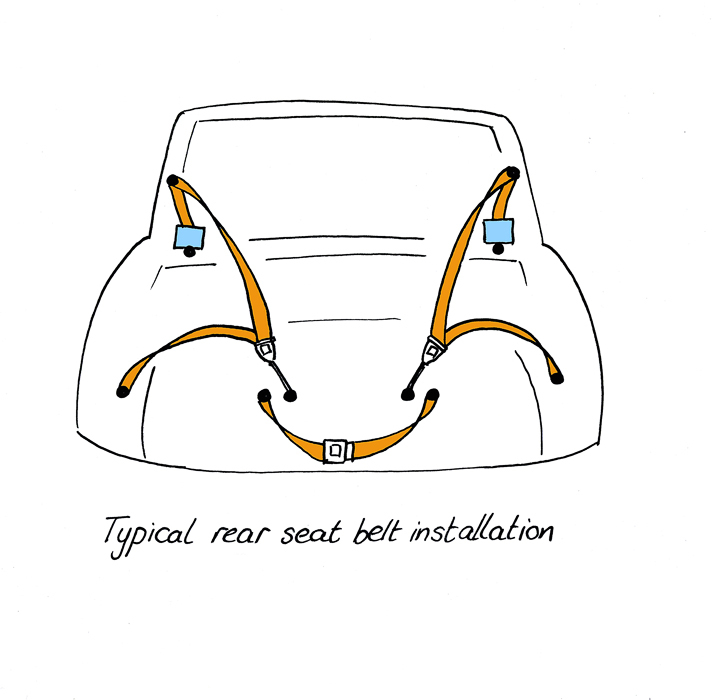 A number of readers have asked about fitting or replacing rear seat belts, so we’ll try to cover most possibilities. Many classics have no rear belts, but do have mountings provided to comply with legislation in export markets of the time. Establish where the mountings are in the car for the two side belts. There will be one under the seat for the socket ‘stalk’ and one near the wheelarch to anchor the lap section of the belt. In addition, there will be one on the rear shelf and/or one on the C-pillar for the shoulder section. If both of these are present, choose a shelf-mounted inertia reel belt with a pivoting top loop on the pillar. If there’s only a shelf mounting, then an inertia belt without pivot can be used. If only a C-pillar mount exists, then you’ll need a static, three-point belt, as an inertia reel mounted on the C-pillar at head height is an injury risk and probably won’t operate at this angle. Make sure you get an inertia reel that’s suitable for your proposed angle of mounting, or it will simply not pay the belt out. Some are designed to be fixed only one way; others are adjustable. The fixing holes are often of a 7/16in UNF thread. The kit of belts should come with special, high-tensile bolts, along with washers and spacers to allow the belts to pivot on the bolts where necessary. Where no mounting holes are present, you’ll need to carefully assess the structural integrity of the proposed fixing area and use reinforcing, load-spreading plates behind the body panels. These should be of steel at least 3-4mm thick and about 60mm x 60mm with rounded edges and corners to prevent them tearing through the metal. Fixing bolts should be fastened with self-locking nuts. It would be a good idea to get a second opinion from an MoT station or other specialist before fitting, preferably with any seats and trim panels removed for ease of assessment.